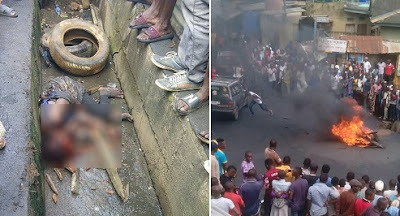 Description of children to be kidnapped, Juju Ring, an iPhone 7 was found in the bag of the female kidnapper burnt to death in Ikorodu. We brought you reports about the Female Kidnapper who was burnt to death in Ikorodu, on Tuesday. According to multiple reports, a man selling meat at Allinson Junction, and also an Aboki selling fruits at the same Junction, close to United High School, Ikorodu raised an alarm after the said woman who was acting like a “mad person” suddenly went to a corner to receive a phone call. She was immediately approached for questioning, and when she couldn’t give a concrete reason as to what she was doing there, she was handed over to the Local Vigilante Office.. On getting there, she was interrogated by the Deputy Chairman of the Vigilante group. They searched her, and found an iPhone 7, a juju ring, and then a list that contains descriptions of children (age range, prices and height) in her bag. The deceased then confessed that she came all the way from Isolo, and that she didn’t come along, but then her other accomplice fled, immediately she was caught. The Vigilantes called the police to take the suspect away, but before the police arrived, a mob that had already gathered were calling for her head. They were demanding for Jungle Justice to be carried out on her. As the Vigilantes couldn’t handle the crowd, they took it upon themselves to take her to the police station. Unfortunately, the crowd were too many for them to control. She was later beaten and burnt to death with her bag containing the list and juju ring.